Successfully Added HD Digital Video Camera - Hi-Def DV Camcorder to your Shopping Cart. High Definition DV camera that is compact in size but grand sized in features. This handheld 720P Hi-Def Video Camera can easily fit in your pocket while packing a lot of performance in its svelte body. This pocket size digital camcorder has a great range of video and still capture features; from easy to use view flip out screen and convenient recording buttons to the easy memory expandability with SD cards and easy in-field changing of batteries. It's not until you capture video and photos from the camera and put them on your TV or computer that you will see this unit's most impressive feature, HD. High definition video fills the entire 16:9 screen with vibrant, clear imagery that must be seen to be believed. Once you see 1280x720P video with 30FPS, you will end up ordering as many more as possible thinking the budget price of this unit must by a typo on our listing. 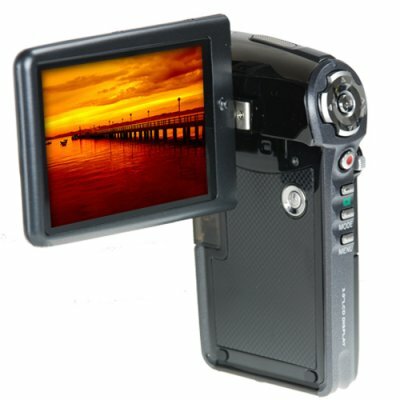 High Definition compact DV camcorder with 1280x720P/30FPS video capture. The one digital video camera that everyone should have. Easy to carry, endless expandable memory, never-ending power by simply popping in more AAA batteries, simple operation, all at a budget wholesale price. Packages includes everything you need. Take it out of the box and start filming. Powered by AAA batteries, easy to replace when needed. No need to buy expensive proprietary batteries. Great as a gift to give to newlyweds, college students, relatives at Christmas, "citizen journalists", etc. Rotating Flip Screen - 270 degree freedom of movement. Provided with Presto VideoWorks software. SD card can be used with any systems including Windows 98SE/2000/Me/XP/Vista, Mac OS, Linux 2.4.2 or later. Supplied software should be used with Windows 2000 or later.